Your house may already be attractive, well-located and in pretty good shape… or then again, maybe it could use a little help. In either case, if you want to increase the chance of your home becoming the center of a bidding war, or selling faster than you may have expected, here are five quick tips for perking up your home — and potential home buyers! 1. 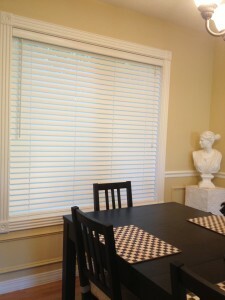 Install wooden blinds. There’s nothing that gives a home a finished, put-together look like wooden blinds. It’s the equivalent of a house wearing a well-tailored jacket. Instantly your room looks luxurious and… well, like it’s worth more. I know, you might be thinking, “but those are expensive!” Actually, wooden blinds are now very affordable, because they can be customized and shipped to you directly from online sites. For example, wooden-blinds.com offers assistance every step of the way, helping you select high-quality custom fit blinds in many styles and colors. Wooden blinds, vertical blinds and roller blinds aren’t just decorative either. They can provide solar protection to keep your room cooler and protect expensive furniture, rugs and artwork from continuous sun exposure. You can also get blinds that roll up or roll down, which will give you greater privacy. I once had a house with a great view of the mountains — as well as the busy road in front of our property. Using “top down” blinds, I was able to block out the view of the road below, giving the room a sense of privacy, while simultaneously framing the mountains and sky. 2. Paint and finish kitchen cabinets. Cabinets get so much wear and tear from being open and closed for years by wet hands, exploding spaghetti sauce on the range top, and over-enthusiastic blenders. We might not notice how much our cabinets have aged during their years of service, but house hunters will. 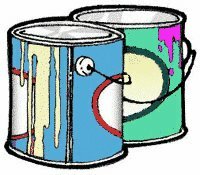 One quick way of polishing them up is to smooth a coat of paint over them… whether that means a wood stain or an attractive color. Sometimes old banged-up cabinets can get that sought-after “shabby chic” appearance with a simple coat of paint. I remember going into an old house with a kitchen that hadn’t been remodeled in decades, however the owners had painted the cabinets a sunny yellow color and they’d installed sunflower door pulls… I wanted to buy that kitchen. Unfortunately the real estate agent told me I’d have to buy the rest of the house that came with it. 3. Spiff up your floor. Look down right now. What do you see? Are you looking at a bedraggled carpet, ugly tiles or mismatched vinyl? It may be time for some spiffing up. But this doesn’t have to be expensive. You can rent a steam cleaner at your local market, which will quickly take the bedraggle out of your carpet. I know this to be true because I walked into an Albertson’s supermarket a few weeks ago, rented a machine for $35, read a couple of lines of instruction before turning on the power, and an hour later the house looked fresh and well-kept. You can also take the ugly out of faded, cracked or headache-inducing patterns on flooring by applying stick-on vinyl squares in light colors, subtle patterns or wood-like finishes. 4. Dress up your yard. A very small investment in landscaping can make a big difference in a home buyer’s ever-important first impression. A freshly mulched yard is much like a newly cleaned carpet — it makes your property look uniformly well-kept. This first impression can translate in a buyer’s mind into confidence that the entire home is equally well-maintained… from the basement to the roof. Of course you still need disclosures and inspections to provide your house’s full story, but there’s nothing wrong with staritng out on the right foot by showing how well you maintain your yard. A few strategically places bushes or small trees can also do double or triple duty — providing beauty, privacy, and blocking out unsightly views beyond your property lines. 5. Get handy with a toothbrush. Two of my favorite home selling tools are Shop Vacs and toothbrushes. I dedicated an earlier article to my beloved Shop Vac, so it’s the toothbrush’s turn in this post. Save your old toothbrushes because they can become one of the most useful and inexpensive tools in your home selling arsenal. Their small, slim size and durable bristles make them the perfect tool for scouring scores of tricky places… behind, beneath, and in-between spaces, corners and tight-fitting places where mortal hands don’t fit easily. They’re also great at cleaning grout, ledges, window screens, crown moulding, you name it. And best yet, we have great natural dexterity for using toothbrushes after years of daily practice. Thank you for your comment Sherry. I strive to not only provide home sellers, Realtors and home owners planning on selling their houses with helpful, practical information — but also to provide a little fun and entertainment while reading my posts! Thank you Joan Gale Frank for sharing the useful information about how to add the value to the our property. I will definitely adopt these 5 tips to increase the value of property. You’re welcome Mike — these are all small things a homeowner can do, but they can make a big difference! Just a suggestion. Get rid of the tooth brush and invest in a steamer. Grout, window tracks, vents, all those hard to clean area’s become a breeze, not to mention every other surface in the home. A steamer can contribute substantially to getting your home prepped to sell fast. It looks like you found a typo Mike! In my book, Home Seller’s Blues, I discuss a number of ways to enhance curb appeal for $20 or under… and actually, the book covers a number of things you can do for free, that can make a big difference to your home’s curb appeal. Thank you for catching that! These are great suggestions! Wooden blinds and mulch is what I would do to upgrade my home. They can change the entire feel of the house. Thanks so much for sharing. Thank you Drew. These suggestions are also ageless and defy home decorating fads! Really, above given attractive ideas will help to sell your house fast without having so much trouble and inconvenience. Proper maintenance is the top most factor while selling a house. Some great tips here on how to perk up you house on a relatively low budget. Other tips include personalising your home so that buyers can imagine themselves in it, as well as de-cluttering so that they can focus on the homes many wonderful features. You may be able to make better use of the space so try rearranging your furniture. In terms of paint, I’d suggest going for an inoffensive, unified colour throughout the home. We would like to share this post through forsaleforlease.com.au ‘s social media. Its a really great read and this would really help alot of people. Thanks again! I have seen your Post. It’s really nice and many readers follow it. I also provide real estate services in Florida. Our company sells and buy your dream house in the best location in Florida. If you are interested, contact us. The fly-by is a “Swiss Army knife”-type shot that works well for quick cuts or sprinkling in some fun to a B-roll sequence. The trick with the fly-by is to set your framing before your subject appears in the shot, and coordinating the movement of the gimbal in relation to the movement of the aircraft. Painting your house will definitely help in making everything look clean and new. Nice blog by the way. Thanks for sharing.